Dr. Diana Boon is a zoo and wildlife veterinarian with over 19 years of experience. After receiving her Bachelors degree, she participated in an African in-country 4 month training program in Wildlife Biology and Management and used this training as a wildlife technician on projects around the US and overseas until applied to veterinary school. She graduated from NC State University College of Veterinary Medicine followed by a large animal medicine & surgery internship at Texas A&M University. 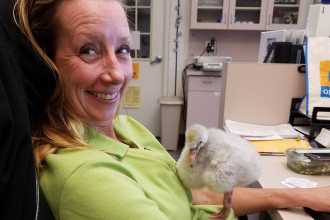 She has worked at Fossil Rim Wildlife Center, Denver Zoo, and over the last three years as a full time zoo relief professional (adding 10 more zoos to her knowledge base). She has been an active teacher, mentor, and participant in Mongolian Argalia sheep conservation project and the California Condor recovery program. She is currently engaged in training for a OneHealth practitioner certificate. Her other veterinary interests are nutrition, natural history, combining Eastern & Western therapies, and exploring best practices for improved animal welfare. She doesn’t have a favorite animal to work on as all her patients are important to her. 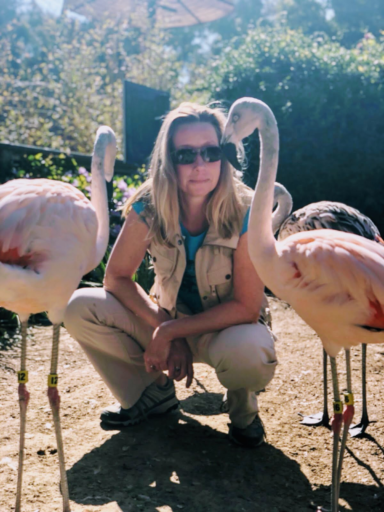 However, she has a soft spot for flamingos, having helped with hand rearing and having recently participated in the South African recovery efforts. Dr. Diana has always been a gypsy at heart and when she switched to her relief role, she moved her life into a small RV to allow her to travel more. When not in the US, she continues to add more fascinating locations to her life story. She is an experienced global traveler, having been to all 7 continents, over 40 countries and every state but Maine in the US. She is also a passionate animal lover, conservationist, OneHealth believer, and women’s advocate. When not doing any of those things, you may find her exploring foods, working on her ballroom dancing skills, engaged in some adrenaline fueled sport, or spending time with animals.